One of the owners of Ramsey Creek Woodworks, Lynn, contacted me about working on their new website. 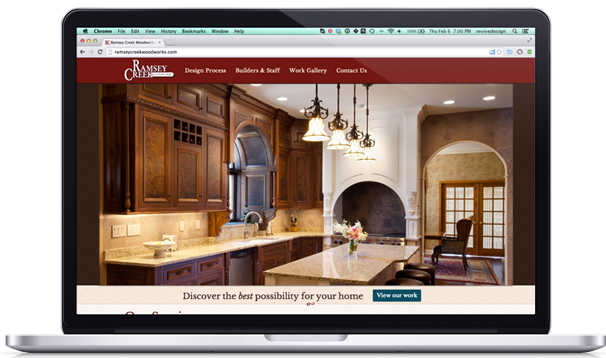 They really wanted the new site to focus on the high-end custom woodworking services they provide. This website is built on the well-known WordPress content management system (CMS) so that Lynn and his team have access to edit the website themselves. The work they do is really amazing. To showcase this, Breahna built a “before and after” work gallery to showcase the transformation they can bring to their client’s homes. Ramsey creek has the ability to add photos and captions to this, as well as to change the order of the photos. We believe clients should be empowered to edit their own website. So, after the project was launched, Breahna went to the Ramsey Creek office to teach them how to edit the text/photos themselves. She also provided them with customized, written instructions so they’d have something to refer to, in a pinch. Of course, we’re always available for edits and updates, but we find that most clients love the ability to edit their own websites. Sorry we haven’t gotten back to you in months… we’ve been so busy since you launched our new website! She looked up his Google Analytics and told him about the traffic coming to his website. He was super impressed and we’ll be adding some cool features on this website very soon.